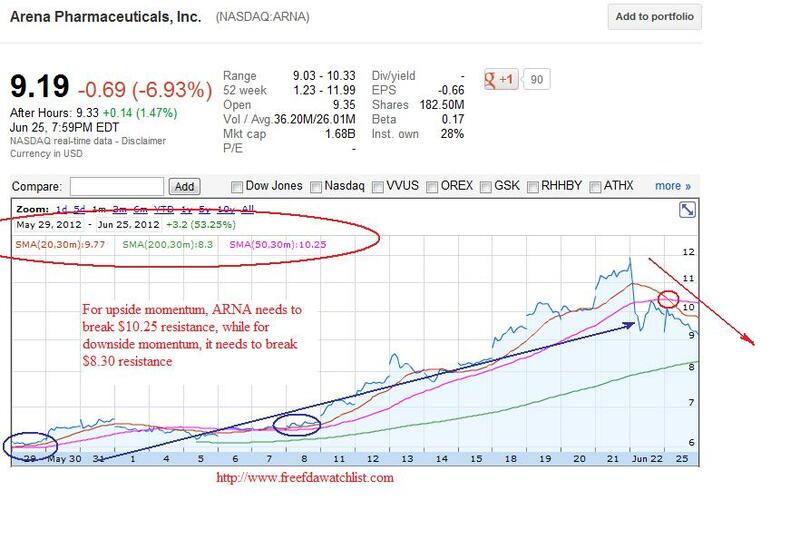 Arena Pharmaceuticals, Inc (Nasdaq: ARNA) has rallied $7.45 or (454%) in last 3 month. On June 27th, FDA will make decision on Lorcaserin (weight management) drug. US Food and Drug Administration (FDA) Endocrinologic and Metabolic Drugs Advisory Committee voted 18 to 4 in favor of Lorcaserin. Although advisory committees provide recommendations to the FDA, the agency makes the final decisions. VVIUS Inc (Nasdaq:VVUS), and Orexigen Therapeutics, Inc. (Nasdaq: OREX ) are other two company waiting to get approval. Fda will take decision on VVUS drug's, Qnexa on July 17th. Whichever company gets first Fda approval will be winner. So, if ARNA gets the approval, it will bad news for VVUS and OREX and vice versa. In 2010, Arena made a deal with Japan's Eisai company for Lorcaserin. Arena will receive an upfront payment of $50 million from Japan's Eisai company and up to another $90 million in milestone payments for U.S. approval and delivery of the product for sale. Also under agreement, Arena will receive 31.5% on the net sale from Eisai and 36.5% on the portion that exceeds $ 750 million. At present, Arena has market cap of 1.8 B. Based on the 1st quarterly result, Arena had $ 88 million in cash, out of which $7 million per quarter it has to pay back as loan interest. Arena reported first quarter loss of $ 29.4 million. This is end of second quarter. With 4 drug in early stage, I think Arena cannot survive more then two quarter unless Lorcaserin is approved. As you know, for any drug to get final fda approval takes long time and to generate any revenue from an approved drug take additional 3-6 month. Steps involved for Fda approval. 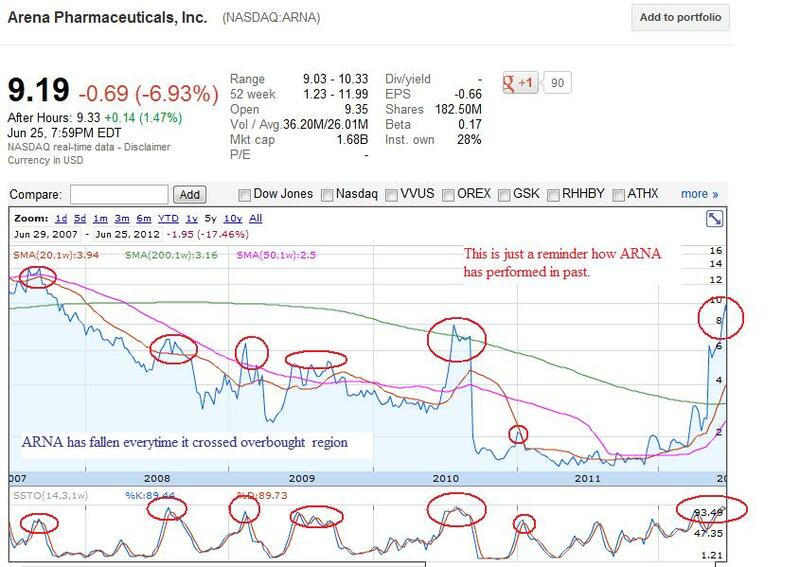 Bearish call on ARNA after 456% rally in 3 month. Any drug for obesity, which could be taken by millions of people without an immediately life-threatening condition, is bound to be held to a high safety standard by the FDA. It will be interesting to see which company can pass regulatory scrutiny and get the early upper hand in the marketplace. So watchout, the movement in ARNA, VVUS and OREX on June 27th.